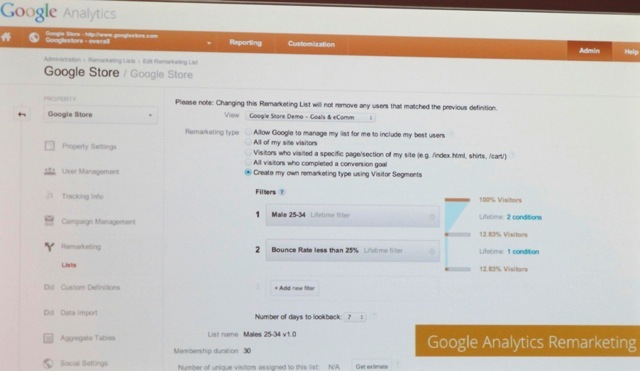 The second part of the 2013 Google Analytics Summit Keynote involved Babak Pahlavan, Director of Product Management for Google Analytics announcing several updates to the product. 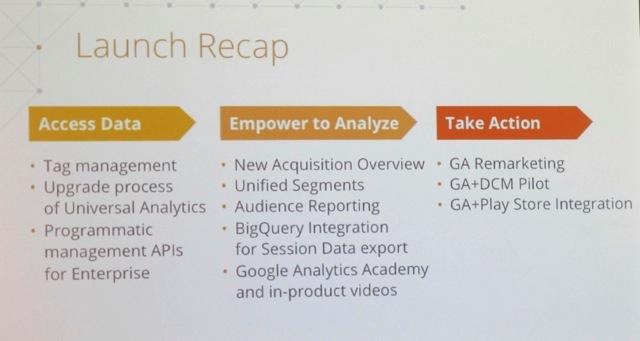 He promises a Jam Packed session of showing what Google Analytics is doing to match the product to the key focuses outlined in Paul Muret’s keynote the Data Opportunity of Access, Empower, Act. 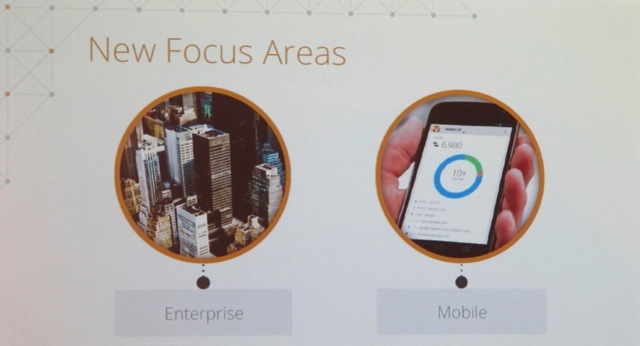 There will be two main focus areas for where Google Analytics plans to take the direction of the product: Enterprise and Mobile. This is obviously in response to shifting trends in the marketplace, as well as requests from Google’s premium analytics customers. As Babak says, we are entering the era of data driven opportunities. Google Analytics has a huge community of vocal users who are giving input suggestions for where to take the product moving forward. Google wants to focus more on enterprise features as well as mobile. 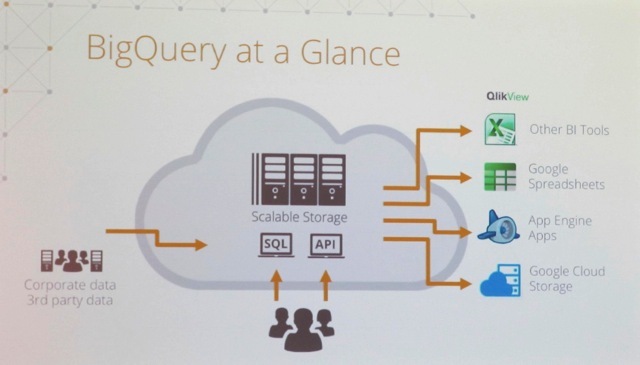 These are both becoming part of Google’s core strategies moving forward. 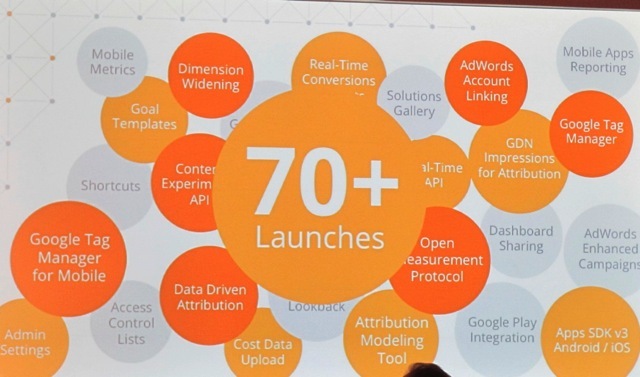 Google Analytics has had 70+ launches in 2013 alone. That’s a huge number! I always say that Google Analytics seems like it changes once a week. It turns out that it is even more frequent than that! There are 14 announcements today (how am I going to type all of this). Each of the announcements fits into the core paradigms of the conference of Access, Empower, Act. This all comes down to Google Tag Manager. The purpose of GTM is to simplify the process of tagging websites and I think it serves this purpose quite well. I am a huge fan of Google Tag Manager, and it’s amazing to see how it has grown to serving over 500 million hits per day! To date, GTM has been focused mostly on the web, but now they have released GTM for native apps. No longer do we have to re-tag code within native apps and then submit to an app store. You can ship the app and then make all of your tagging changes at the server side! That’s a huge development for mobile developers. 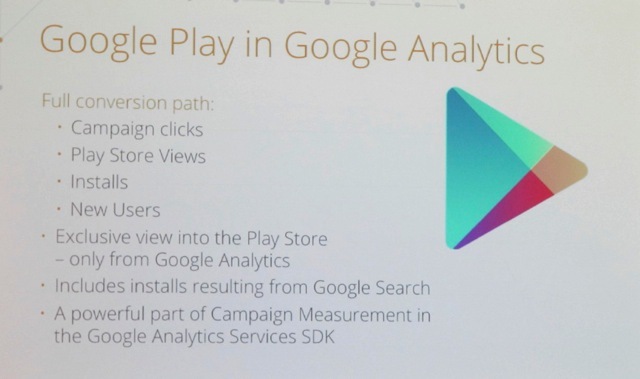 Since they believe in eating their own dog food, Google is using Tag Manger in their own Google Analytics app for Android. The new releases of Google Tag Manager are helping them improve by building features that did not previously work within Google Analytics. This leads to our first announcement: Tracking multiple events happening on a page automatically! Now instead of tagging multiple events on a page using the data layer (which defeated the purpose of tag management in the first place), you can do this within Google Tag Manager automatically. I am so happy about this development! They are solving one of the biggest deterrents I have seen for GTM to date with this update and making dynamic tag firing the new standard for even tracking. 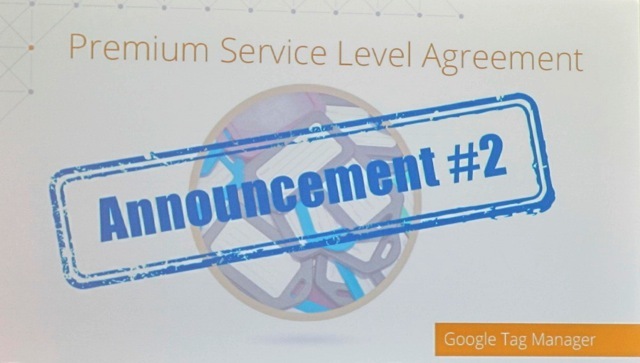 This feature is mandatory for the acceptance of Google Tag Manager within the enterprise setting, so it was needed to make the product widely adopted by premium customers. This will be rolling out in Q4 of 2013. 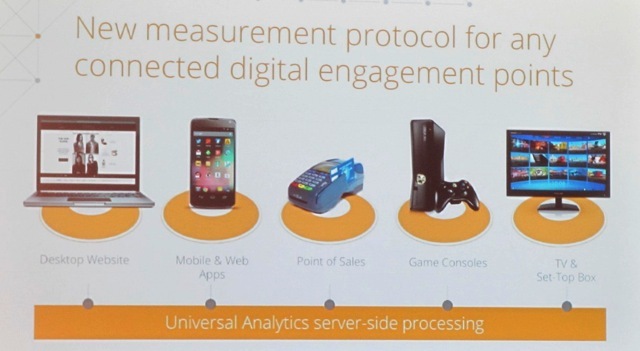 Brand new measurement protocol moves from browser based to server side. 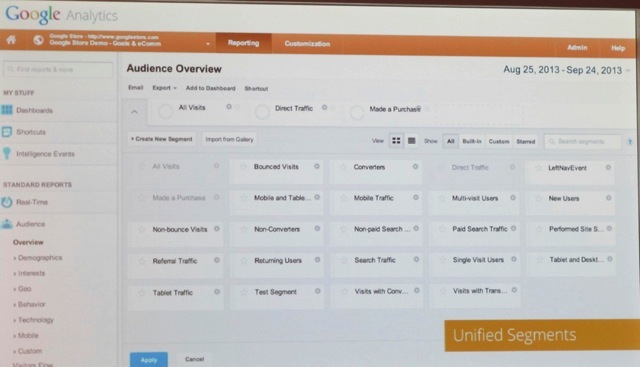 Also known as Universal Analytics, this allows you to track user centric analytics as opposed to device specific measurement. 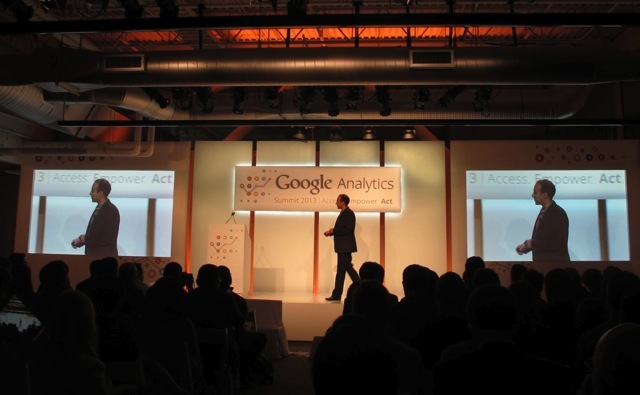 Make sure to read my post on the Universal Analytics announcement from last years Summit. This is something that I figured had to be coming in the next few months, but it is still great to see it formally announced. 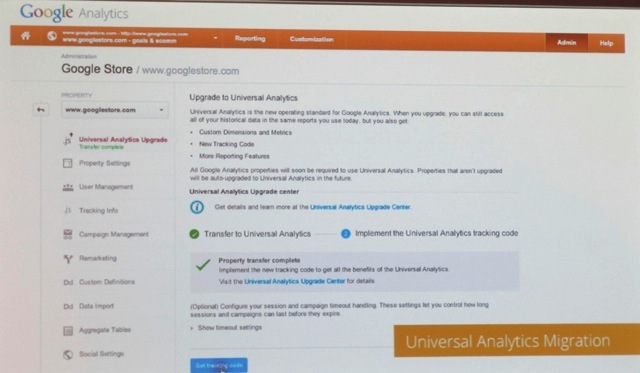 With this feature in place, I anticipate a lot more people adopting Universal Analytics. 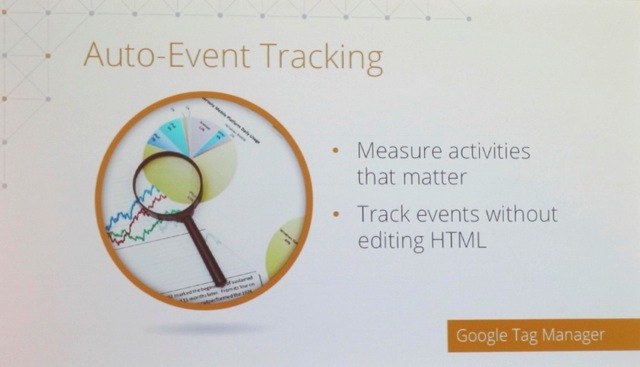 I’m not sure how this new slide slipped in there, but next Babak talked about the new Google Analytics announcement for tracking estimated conversions in Google AdWords. Read about it here. 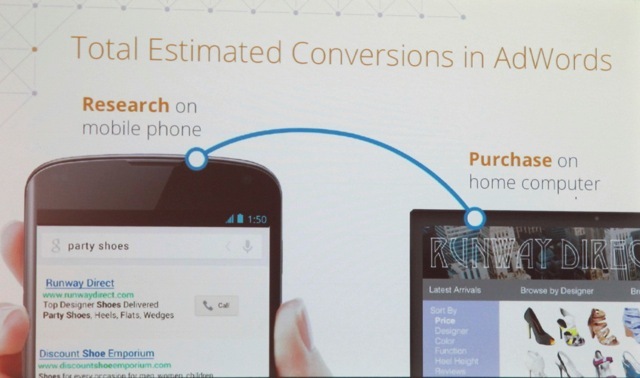 Catch offline conversions across devices. 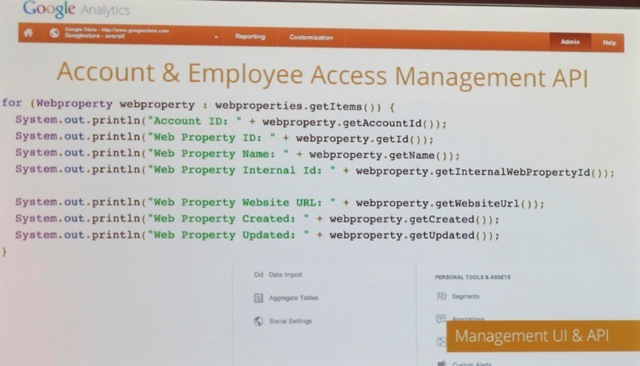 This is an enterprise feature that makes user access much easier for big organizations. The goal is to democratize access to everyone in the organization. I have been using this feature for a few months and I really like the way it brings information to the eye. While I think that there is some room for growth, it is great to see this announced to the public. Rolled out to 100% of users over the next few weeks. The best part of this feature is the defined channel groupings that allow you to track certain source/mediums as a consolidated group. This is a nice feature for customer acquisition reports. This feature has been available to all users for a while and makes segmentation significantly more useful. 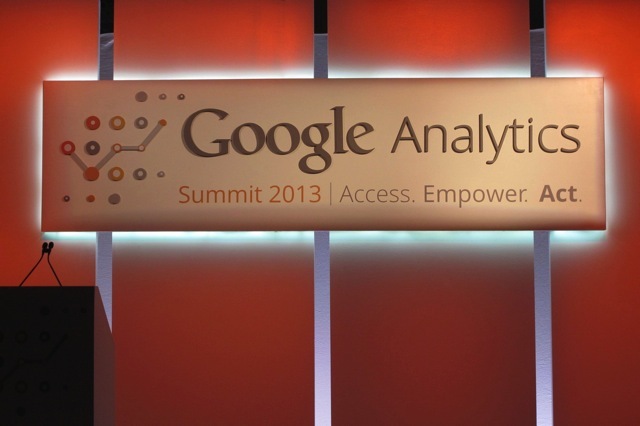 What is missing from Google Analytics today? Demographics! 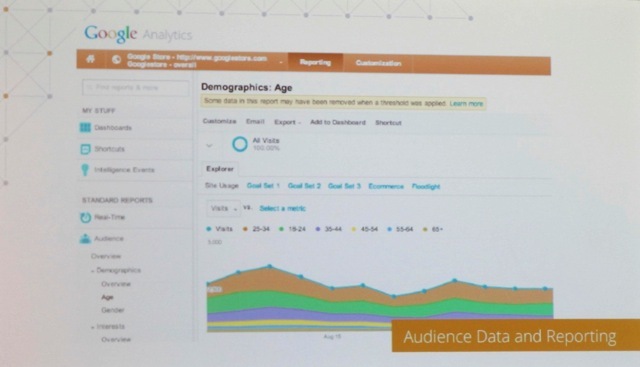 Now you can start to see demographic information in Google Analytics by integrating with Doubleclick. Implement DC.js on your properties and start to see demographic information inside of your Google Analytics reports. Based on the powerful classifications of the Google Display network. Demographics are a marketing goldmine and this information can only help Google Analytics reports become more useful. 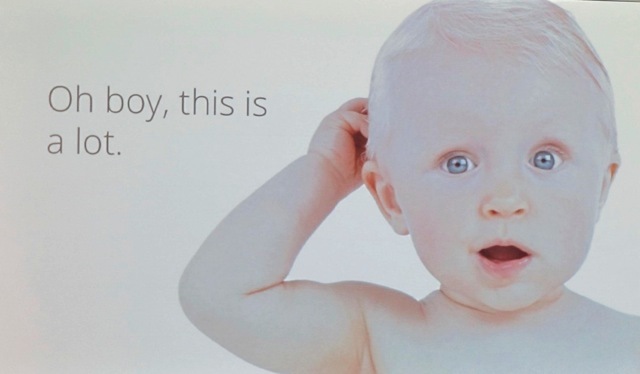 How is my audience behaving based on demographic information? 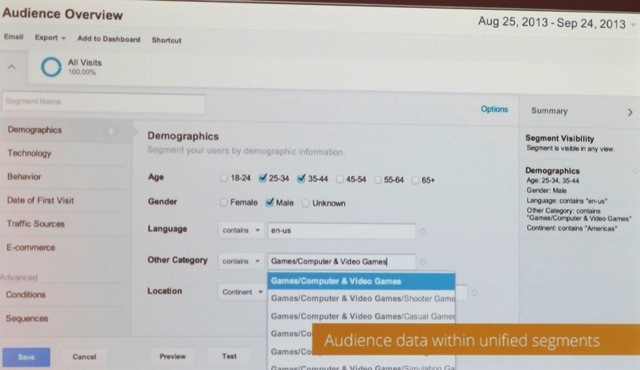 Now you can find out by seeing demographic data inside your advanced segments. Exclusive for GA Premium customers, which is the demographic who would benefit most from this type of data access. 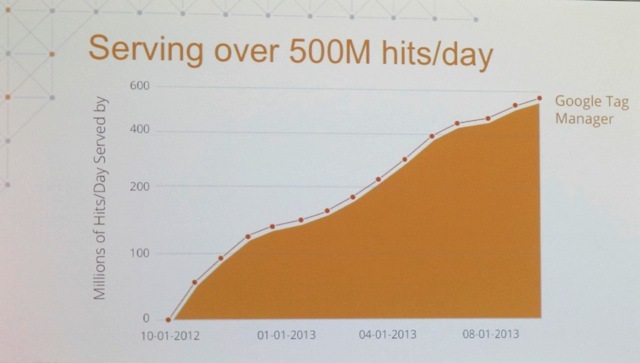 Big teams of developers and analysts can do a lot of good with this data. Most small companies will have no idea what any of this means. I personally believe that there are hundreds of other reasons preventing this data from being actionable, but for the purposes of this live blog I’ll leave opinion out of the commentary. Every day we miss potential buyers because they can’t find what they need on our sites. 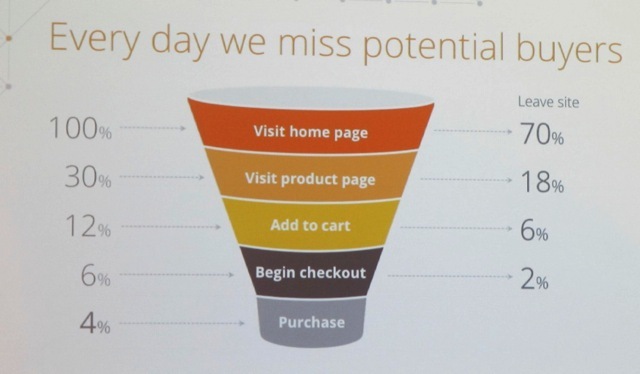 96% of traffic is lost from websites (4% on average are converting). Surprised to see the number this high. I think many sites convert much worse. What do we do about it? 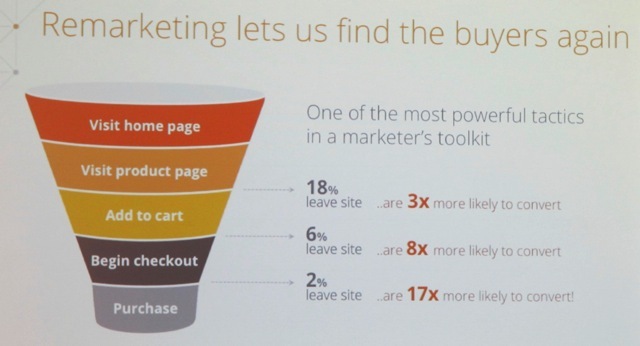 Remarketing helps us find buyers again! Using GA Remarketing and Dynamic Remarketing based on interests, we can bring back high potential users to buy something on our sites. 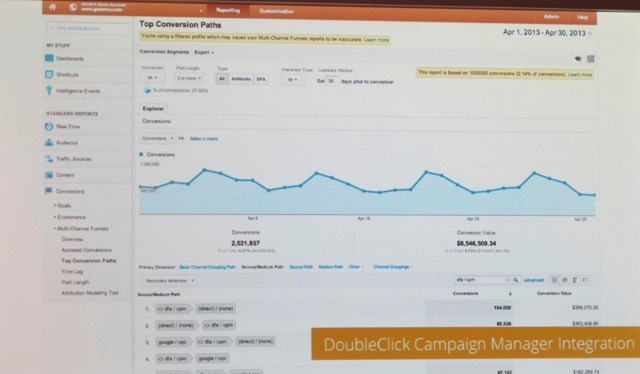 This feature allows us to share campaign data between Google Analytics and Doubleclick Campaign Manager for better remarketing performance. This integration will give us more insight into what is happening on our site and allow us to close the loop from advertising impressions to conversions. This feature provides new visibility into the full conversion path for companies that have mobile apps. 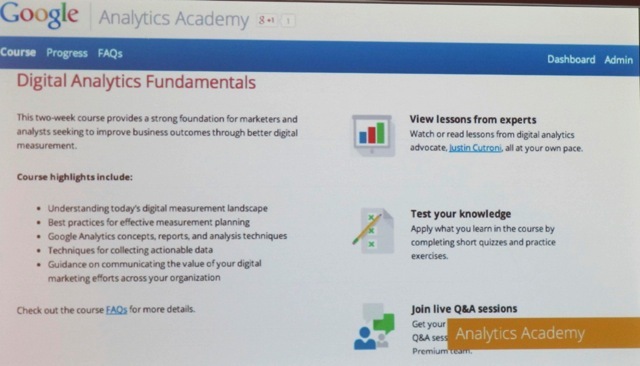 It promises a new level of understanding visitor flow that wasn’t previously available in GA.
Google is introducing an opportunity for people to take real online courses taught by Google’s Education team. This follows the MOOC (massive online course) model of education and allows anyone to be trained by Google professionals through the Internet. Personally, this is a little scary for my ability to provide educational services to students, so it will be interesting to see how this affects enrollments for my GA Training courses. 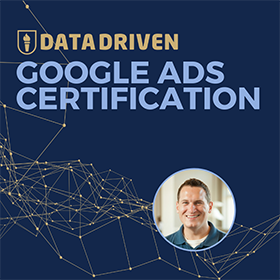 These course will be done through Google Plus hangouts and they promise high quality content and instructors like Justin Cutroni. 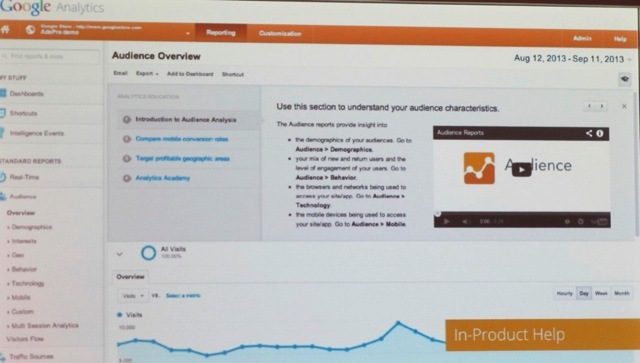 Last, every feature in Google Analytics will have an in product video that people can watch for more information about how to use a certain feature. You may have already noticed this in your GA account and you can expect a full roll out in the near future. We are seeing a wider gap being created between small advertisers and the enterprise. 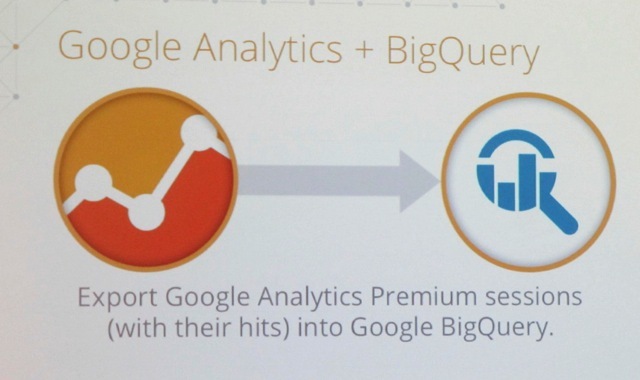 While all Google Analytics users will benefit from these additions and changes to Google Analytics, many of these features will only be used by a small percentage of the sites that have Google Analytics installed. 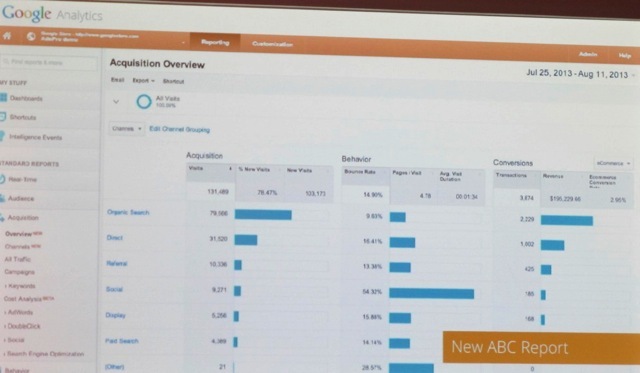 I am not convinced that these features being available in Google Analytics will encourage more small businesses to advertise on Google, but I can see that these tools may make large advertisers even larger. 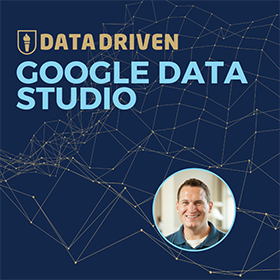 From a product investment perspective, it makes a lot of sense that Google would be taking this approach to their product, because the users that fuel the economic engine of both Google Analytics and Google the company as a whole. 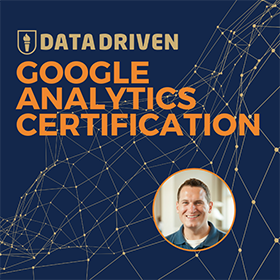 My main hope is that this balance can be maintained well into the future and that small businesses are not left behind by Google Analytics moving forward. That would create a disastrous imbalance of power in the online marketplace. Please don’t be evil, Google.